Favorite place you visited on your first season: Thailand Â– it was very beautiful and the scenery was so peaceful. "I did not piss away a million dollars. Let's just clear that all up." 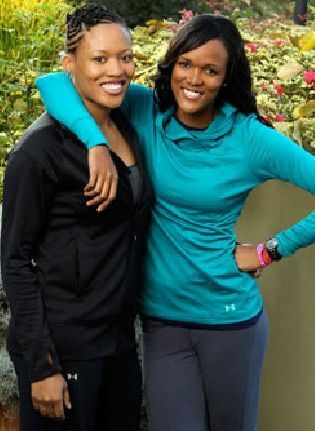 Kisha and Jen: LaKisha Hoffman, 30, and Jennifer Hoffman, 26, missed making the final three in season 14 by mere minutes all due to a bathroom break during a sprint. "There are certain things that you can’t prepare for," says Jen, "but you can do things when it comes to packing, [and] we recently decided we needed to take swimming lessons because we know it will come in handy!" No more fear for water!! Go sistahs! Make me proud. Best line in that video! I almost forget how awsome these two were because of that fight with Luke. They are on my top list because of that!! That would be Kisha and Jennifer Hoffman. The sisters — both former standout athletes at Seton Academy in South Holland — were born in Chicago’s Roseland neighborhood. They spent their early years in Pullman before bouncing among several south suburbs, namely Riverdale and Dolton. All of that moving during childhood probably was good training for their whirlwind globetrotting adventures on “The Amazing Race.” The Hoffmans are among 11 teams in the show’s upcoming 18th season, titled “Unfinished Business,” where prior contestants get a shot at redemption — and $1 million. During the 14th season, Kisha and Jen missed a spot in the final three by mere minutes after taking a bathroom break in China. “We went back to our normal lives, not thinking they’d ask us to do it again,” said Jen, 26, whose normal life means coaching volleyball at her alma mater, the University of Louisville in Kentucky. Kisha, who also graduated from University of Louisville after spending her first two years at Western Illinois University in Macomb, coaches middle school girls in basketball. She’s studying for a graduate degree in social work. Neither of the sisters hesitated to put their lives on hold late last year, hop on a plane and race again. This time, the 6-foot-2-inch siblings were more prepared — at least when it came to luggage. Having done the race once, you would think the second time around would be easier. Viewers of Season 14 know the one area where Kisha and Jen needed to be better prepared: the pool. Jen’s paralyzing fear of the water and inability to swim almost kept them from completing a leg of the race. As soon as they got the call to come back, they signed up for swim lessons. Even so, swimming remains one sport these Division I scholarship athletes haven’t mastered. Tune in to see if the sisters sink or swim at 7 p.m. Sunday on CBS. True! Loved them more this time! "For the record, I did not piss away one million dollars"
"I will NOT drink four bottles of water on my way to the pit stop"
I'm definitely feeling more love for this team this season. The sisters are generally nice and worked well together.. and more encouraging to one another this time round. I bet the producers wanted to see more drama between them and Luke.. but they didn't get their wish (for now). 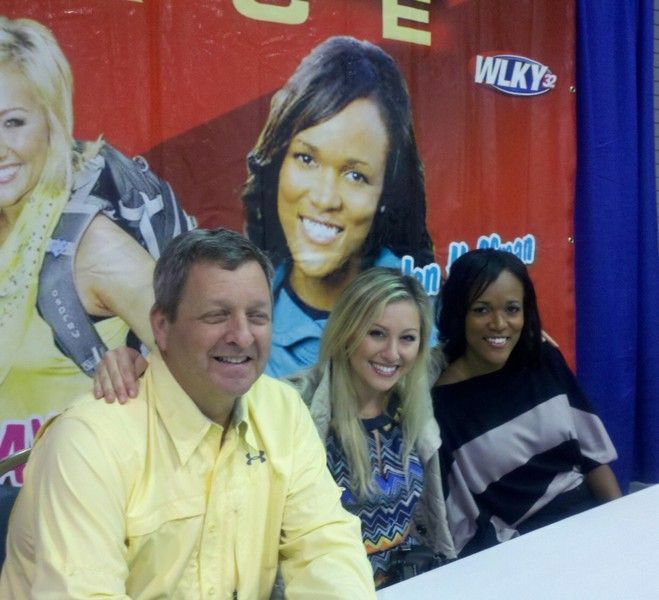 Jen at the Louisville car show yesterday. When Kisha asked Mel how was he.. did anyone go.. Awwww? I just hope you make it to Miami, and that is half the win! Well, my thought and hope is that they were UTR because they are the only F4 team to not win any leg. I hope that it changes in the last 2 eppys. Hopefully the waxing drama will give more spotlight to the girls. And this is WAY better knowing they beat the Trotters in some physically demanding tasks and a 7¿? mile bike ride to the Finish Line!! Hurrah for the sisters! They deserved it, they led the whole finale and won the only leg that mattered. Although they had only placed out of the top five once this year. 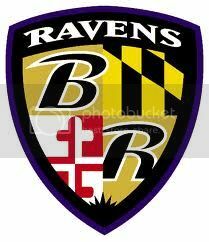 The only team in the race to accomplish that! Gratz on winning you defiantly deserved it!